It’s looking like its going to be another fantastic week. Days that are hot, the kitchen is the last place I want to be. We happily throw things on the bbq, while hanging around on the deck. 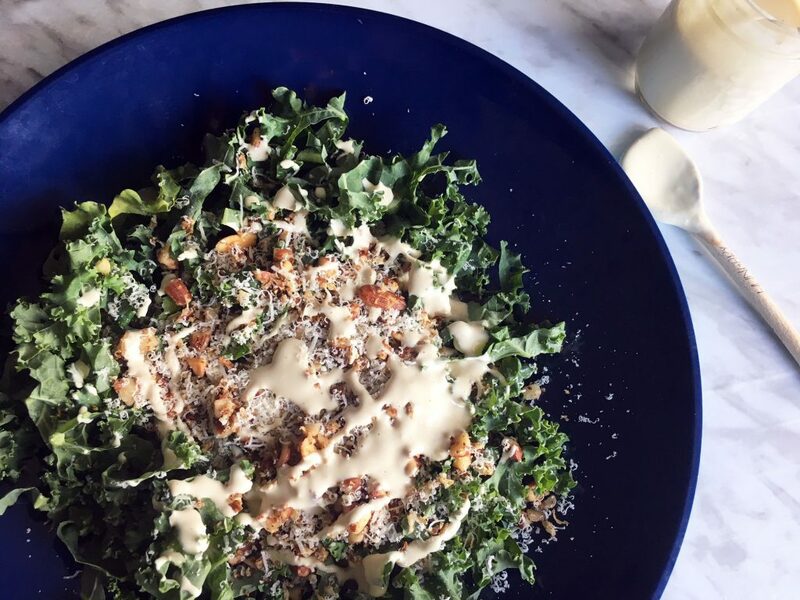 We tend to eat a little lighter when it’s hot and salads become main meals, using whatever is in season. 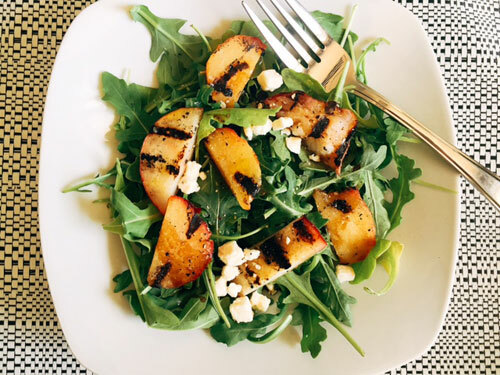 Grilling stone fruits like nectarines and plums and then adding them to greens makes a delicious salad, definitely not boring. The fruit takes minutes to cook and really brings out the flavour of the fruit. 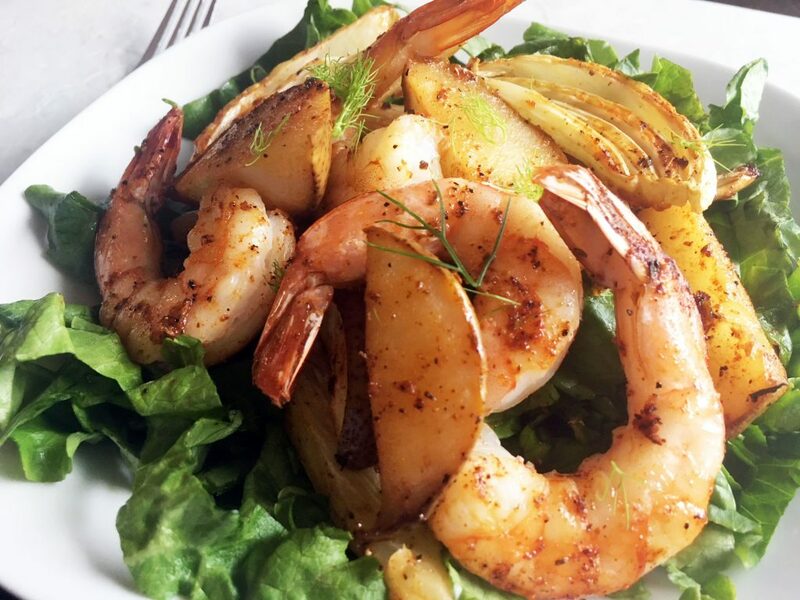 Olive oil and balsamic are all that’s needed to dress the salad. We also can’t forget the cheese, the perfect finishing touch. Grill the fruit by cutting it in half, rubbing it with a little oil and placing it on the bbq. 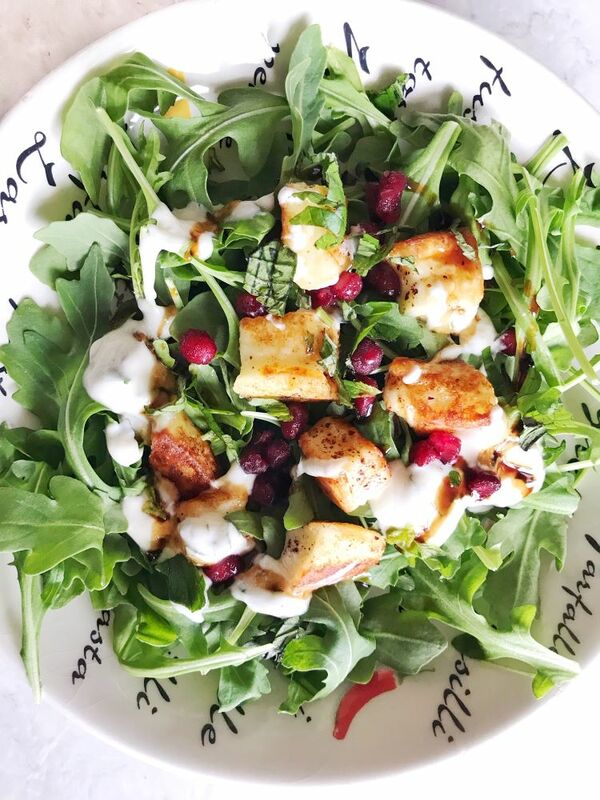 After a couple of minutes, remove from the heat and place on top of your favourite greens, like arugula. 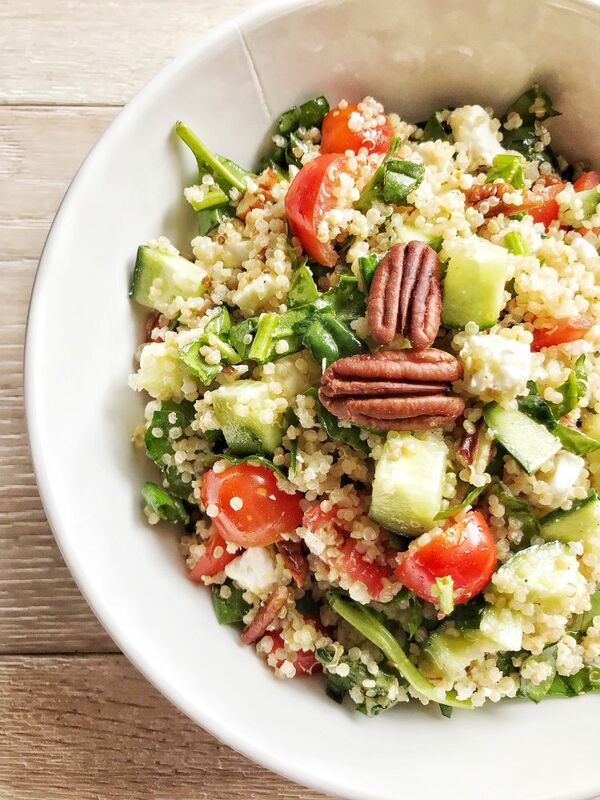 Drizzle with extra virgin olive oil and balsamic vinegar, add salt and pepper and top with a sprinkling of feta. This is great as-is or made heartier with some chicken or beef. 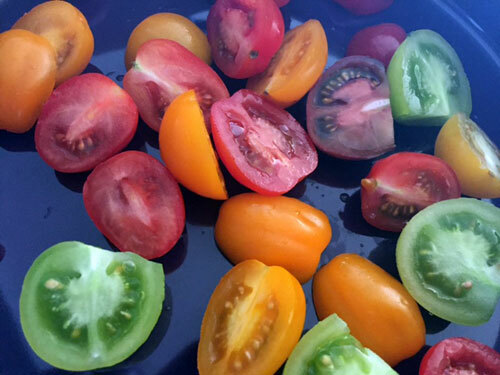 When I went grocery shopping last week, tomatoes were not on the list since I had so many at home. But when I saw the container of coloured ones, I just couldn’t resist. Red, orange, green, purple – they were just so pretty! 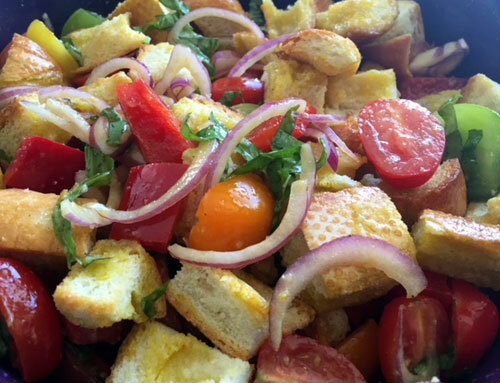 I immediately thought of a Panzanella salad – tomatoes and bread, the perfect combination. I bought a loaf of French bread which got polished off way before I had time to make a salad. Did I mention we love bread around here? I went and bought another loaf on the weekend, determined that it would make it into the salad this time. 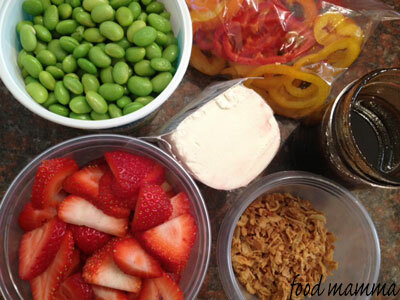 Saturday was a hot day so we pulled a few marinated items from the freezer (so handy!) and enjoyed them with this salad. It was bright and refreshing and we polished off the bowl. Place the cubed bread on a baking sheet and drizzle with oil, salt and pepper. Bake at 350 degrees until toasted. 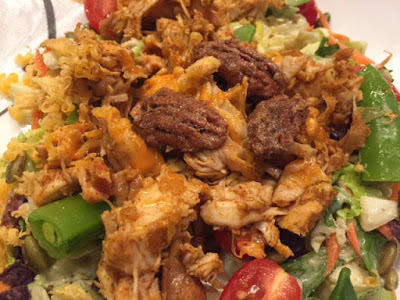 Combine all the ingredients for the dressing. 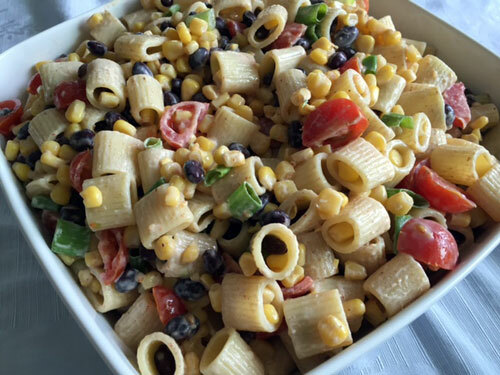 In a bowl, combine the vegetables, add the toasted bread and drizzle with the dressing. Let sit for a little while for the bread to soak up the dressing. At our house, we are nuts for nuts. Like all kinds of nuts. 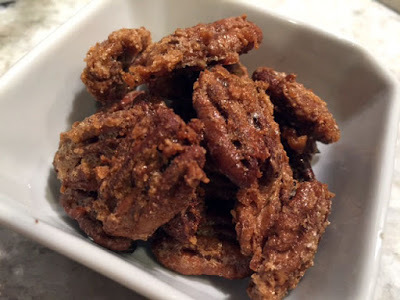 One of my favourites though is pecans. I was looking for a way to perk up my salad and thought candied pecans would be perfect. The coating is light and crispy and I loved the addition of the cinnamon and salt. They provided the perfect crunch that I needed for my salad but they were also great for snacking on. These are so good and very addictive. You have been warned. Beat the egg white until frothy. Add the pecans, cinnamon and salt and mix until coated. Bake at 300 degrees for 25 minutes. It seems like everyone lately has been spiralizing their veggies. Who could blame them? Any way to make veggies a little more exciting, especially to the kiddos, is always welcomed around here. I received the Microplane Spiral Cutter recently and was excited to play with my food. 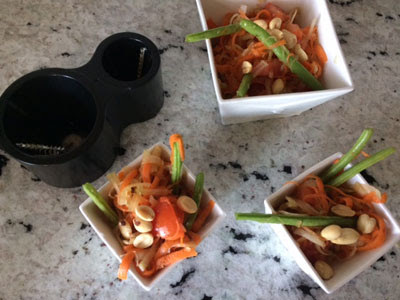 It was like a big sharpener but for your veggies. Zucchini made nice long noodles to substitute for pasta. Long strands of carrots were more fun to eat than a big carrot stick. This is my submission for their blogger recipe contest. 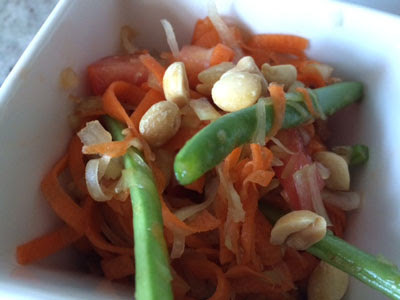 This green papaya and carrot salad makes the perfect side to accompany pretty much anything. We paired it with some bbq’d beef and it was fresh and flavourful. 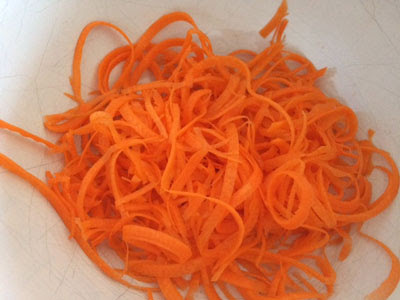 In a large bowl, combine the spiralized papaya, carrots, tomatoes and green beans. In a separate bowl, combine the fish sauce, garlic, lime juice and sugar. Pour over the vegetables and combine until incorporated. Top with peanuts and enjoy! Happy Father’s Day to all the wonderful dads out there! Hope everyone had a great time celebrating the men in their lives. We had a family potluck and my job was salad and dessert. Since we were initially going to have a picnic, I decided that cupcakes were the way to go. They’re portable and everyone could have their own. 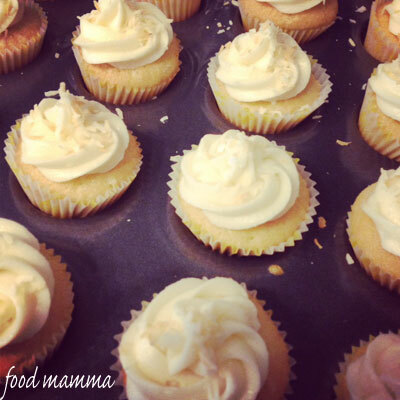 Although we skipped out on the picnic, I stuck with the original plan and made some mini coconut cupcakes. I know some people think that being in charge of salad can be kind of boring. I think if it is, the salad is just not worth eating. It’s always fun to play with textures and tastes and make a salad that everyone goes back for. I started with the greens, both spinach and baby romaine. I also wanted to add a few of Q’s favourite things, so that he would be enticed to eat his veggies. One thing he can’t seem to get enough of, at the moment, is edamame. These were cooked for less than five minutes and cooled. 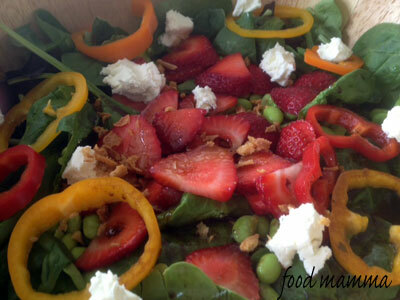 Added to the mix were crisp rings of sweet peppers, sweet slices of strawberries, tangy goat cheese and crispy fried onions. 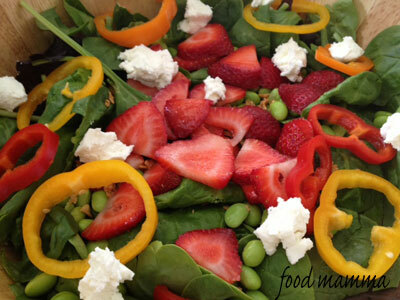 I thought a balsamic dressing would be great to go with the strawberries and goat cheese. The tangy balsamic was cut with a bit of sweet honey and the salad went perfect with our Father’s Day meal of ribs, chicken, rice, corn and potatoes. Combine and drizzle as needed.